The Group 1 metals is called the Alkali Metals. This is because they form oxides and hydroxides that dissolve in water to give alkaline solutions. 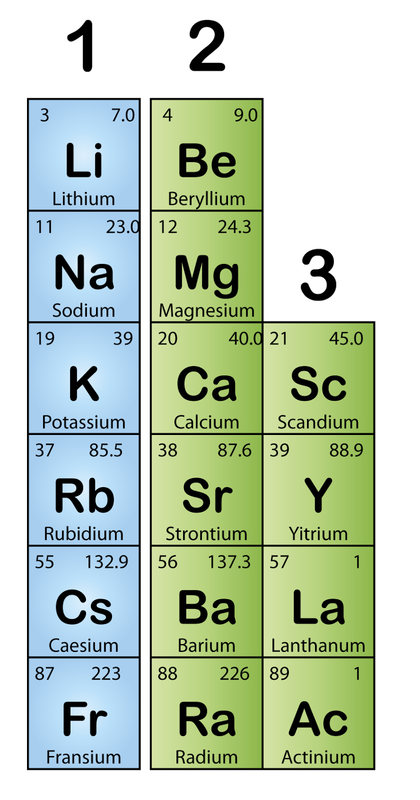 As shown in the diagram on the right, elements in this group are lithium, sodium, potassium, rubidium, caesium and francium. They are the first element of a period, with one valence electron. This similarity (1 valence electron) makes them chemically behave in a similar manner. All alkali metals are very reactive. They must be stored in oil prevent reaction with oxygen or water vapour in air.